On Tuesday 23rd April 2019 the sun will rise at 05:52 and will set at 20:31. It will be a mild day, with temperatures reaching around 20°C. Today is expected to be a dry day, with a very low chance of rain. It will be quite a breezy day, with a maximum expected wind speed of 16mph. On Wednesday 24th April 2019 the sun will rise at 05:50 and will set at 20:33. It will be a mild day, with temperatures reaching around 14.3°C. Some moderate to heavy rain is expected, 8mm of rainfall is possible today. It could be quite a gusty day today, with a maximum expected wind speed of 23mph. On Thursday 25th April 2019 the sun will rise at 05:48 and will set at 20:35. It will be a mild day, with temperatures reaching around 12.9°C. Some moderate to heavy rain is expected, 5mm of rainfall is possible today. It will be quite a breezy day, with a maximum expected wind speed of 15mph. On Friday 26th April 2019 the sun will rise at 05:46 and will set at 20:37. It will be a mild day, with temperatures reaching around 12.7°C. Heavy rain which could cause some standing water is expected, 12mm of rainfall is possible today. It will be quite a breezy day, with a maximum expected wind speed of 17mph. On Saturday 27th April 2019 the sun will rise at 05:43 and will set at 20:39. It will be a mild day, with temperatures reaching around 8°C. Some moderate to heavy rain is expected, 5mm of rainfall is possible today. It could be quite a gusty day today, with a maximum expected wind speed of 32mph. On Sunday 28th April 2019 the sun will rise at 05:41 and will set at 20:41. It will be a mild day, with temperatures reaching around 9.5°C. Today is expected to be a dry day, with a very low chance of rain. It will be quite a breezy day, with a maximum expected wind speed of 30mph. On Monday 29th April 2019 the sun will rise at 05:39 and will set at 20:43. It will be a mild day, with temperatures reaching around 5.1°C. Today is expected to be a dry day, with a very low chance of rain. It will be a very clam day today, with a maximum expected wind speed of 10mph. Greta Hall is a stunning Grade I Georgian manor house situated in the heart of Keswick surrounded by three acres of garden, untamed woodland and river frontage. The structure of the house has changed little since the early 1800s and retains many original features; open fires, wood burning stoves, large bedrooms, cosy reception rooms, well equipped kitchens and stunning views from every window, it is a wonderful place to stay. 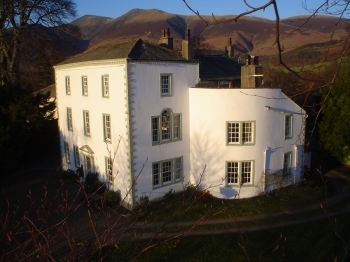 Greta Hall is an ideal base for literary scholars, walkers, cyclists, families, groups and historians. Bed & Breakfast guests have access to Southey's Study, whilst Coleridge Wing guests occupy Coleridge's Study and Parlour. The huge garden makes Greta Hall even more special - a paradise for children with 'the best climbing frames in England', rope swings, zip-wire, trampoline and the river for paddling.a petting zoo with rabbits, lambs, guinea-pigs, hens, ducks & geese. For grown-ups a slate BBQ and fire pit, a path through the woods, tables & chairs.